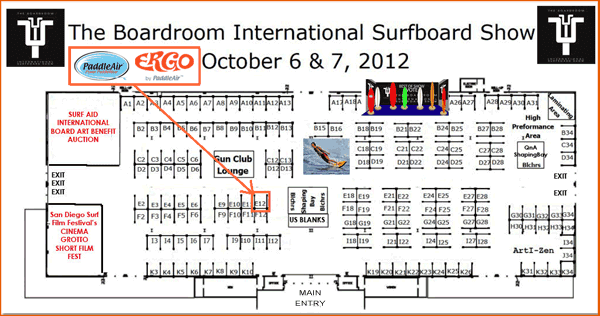 Look for the PaddleAir booth at The Boardroom International Surfboard Show (a.k.a. 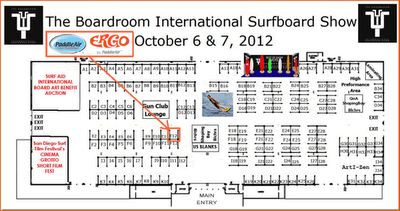 SurfboardExpo and Sacred Craft) on Saturday and Sunday, October 6 and 7 at the Del Mar Fairgounds. Like last year, we have a great and convenient corner booth -- #E12 (see the floor plan below). Be sure to stop by and say hello to PaddleAir founder Dave Hilts and surfing friends.